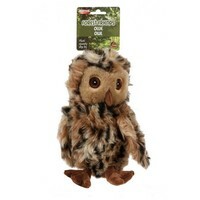 Ollie Owl Squeaky Soft Dog Toy is an exciting new toy from Animal Instincts' new collection 'Forest Friends'. It includes a terrific squeaker that will keep your dog entertained for hours. This toy is perfect for interactive games such as fetch and retrieve. Made from a premium quality ultra soft fabric that is machine washable, Ollie Owl is sure to be a hit with your dog. This toy is not designed for excessive chewers.